January is coming to it’s end, which brings us face to face with Valentines day. I wasn’t ever much of a fan of the holiday until I had kids, suddenly I had the cutest little Valentines ever, and all the mushy cuteness was fun again. Each year the kids and I make cards for those in our lives that we love. Even the dog. Dogs get our love too. On the big day we have started the tradition of Heart Pancakes. There are a couple ways to accomplish this. I usually take an empty clean Hershey’s Syrup bottle and pour my own pancake batter inside. Once everything is ready I “pen” the hearts out on my griddle. Always make them just smaller than you think you should, because pancakes will spread. When making my batter I often use some food coloring to make the pancakes pink, red, or purple. Makes the kids happy anyway. To top these delicious goodies we opt for fresh strawberries. Sometimes a drizzle of chocolate syrup. Yum. 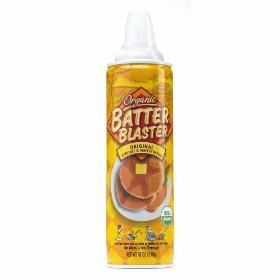 If you don’t feel like making your own batter you can buy some Batter Blaster. It’s pancake batter in an aerosol can. You just spray the batter like you would whipped cream. Of course you won’t be able to make your pancakes pretty colors. But you’re saving yourself about 15 minutes of prep work in the kitchen. Your choice. To round out this meal, I serve bacon and eggs. I haven’t found a way to make eggs very Valentine appropriate; my kids only eat them scrambled, and there isn’t much you can do with that. The same with bacon. It’s bacon, and any day that you serve someone bacon is a testament to your love for them. In our house, bacon equals love.